If you thought building a dollhouse was fun, wait until you get to the decorating phase. From Victorian style to modern, quirky or something in between, you can decorate your dollhouse however you please. But just like decorating your own home, there are some general design rules you want to follow to make sure your rooms look well put together. It’s the details that make a house a home, and the same can be said for a dollhouse. Placing coffee tables, night stands and dressers in rooms gives you more space for little accessories. A pile of tiny books on a table next to the sofa adds charm and brings the room to life. A vase of miniature flowers on the dining table or a collection of pillar candles on the mantle by the fireplace will make your dollhouse feel like a home. It’s all about the details, right? Adding on to the first point, accessories can really bring your rooms to life. Add miniature towels to the shelves in the bathroom, and don’t forget the wastebasket. From miniature toothbrush cups to plants, shampoo bottles, and everything in between, you can find miniature versions of everything you’d find in a typical human bathroom. And these same accessories can be found for every single room in your dollhouse. From wall clocks to miniature pots and pans, lamps, and everything in between, you’ll find everything you need to accessorize your dollhouse. Take a look around your home. In every room, you’ll find traces of yourself and your personality. Your dollhouse should be no different. Hang miniature photos of your family on the wall. Choose the colors and décor items that you would put in your own home. If you love crafting, add a craft room. If you love to paint, make one room your miniature art studio. Adding a little personality to your dollhouse will make it more appealing. 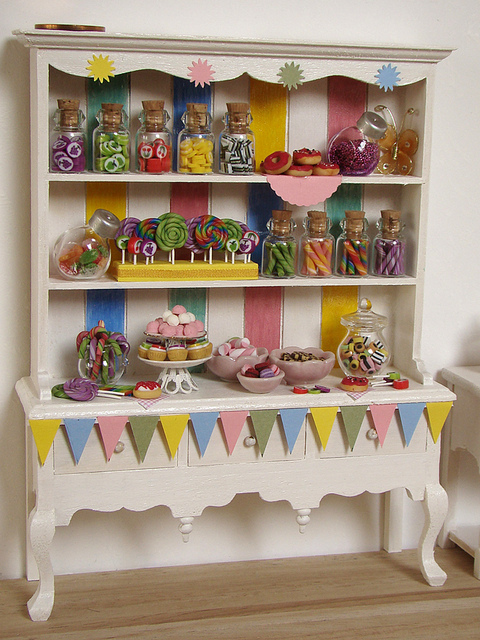 Decorating a dollhouse is really no different from decorating your own home – just on a much smaller scale. Place art pieces above furniture to create balance. Hang just a little above the furniture to create an eye-pleasing connection. Group objects of different shapes and sizes using an asymmetrical arrangement. Avoid using accessories of the same height and scale (e.g. candles or books). Choose colors that coordinate well, or go for a monochromatic scheme. Use these four tips when decorating your dollhouse to add personality and bring each room to life. Dollhouses need life, and what’s the one thing that life needs besides water? Food! 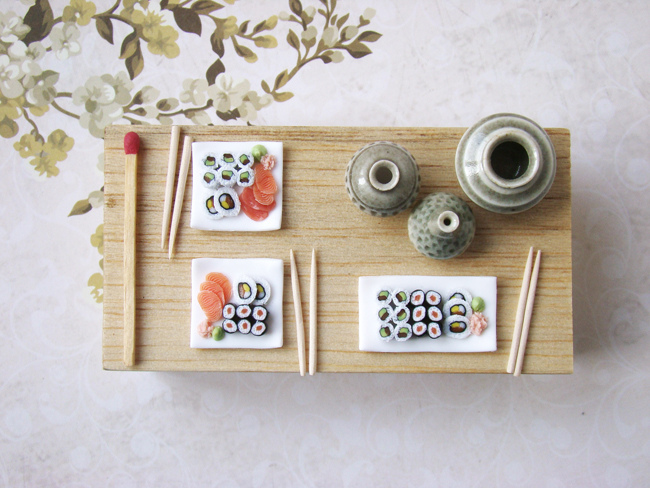 Miniature food is fun and easy to create, and it will add a whole new element to your dollhouse. We’ll be covering the process of making the food so that you can recreate the process yourself to make cute, tiny foods for your dollhouse. It’s pertinent to know that you’re making items that look like food. 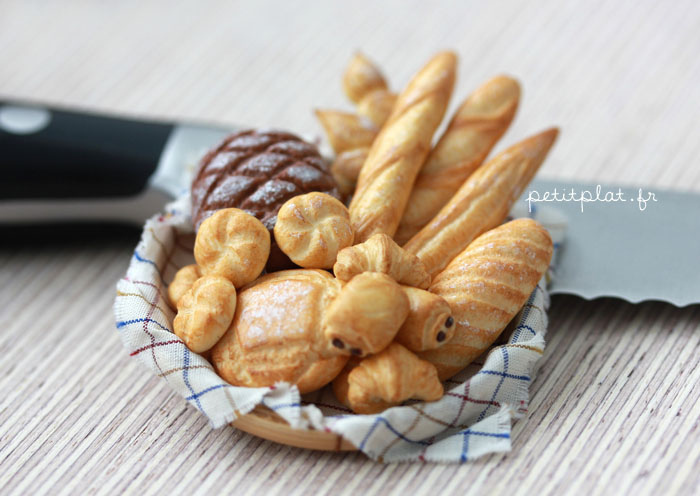 Since these items aren’t edible, you’ll have to use your imagination to truly recreate food. Now, those eggs in the frying pan may not be edible or smell like eggs, but a black pan with a yellow blob looks a lot like eggs. And don’t worry if everything isn’t perfect – imperfections are beautiful, too. You’ll need something to go off of when making your creations. I recommend either recreating foods that you know well or can cook in your home, or you can use the Internet to find food pictures. The second thing you’ll need is polymer clay. It’s very easy to work with, it’s cheap and there are a variety of colors available. This is the most useful material to make miniature food. Just picture something simple like an orange. You can make a small ball with orange polymer clay, add small dimples to recreate the texture of the orange, and that’s it. A small putty knife is a useful tool. Keep in mind that large putty knives that are used for your home aren’t small enough for the precision you need. And if you create little furniture or bowls out of clay, you can use these, too. Your imagination is the limit. One neat trick is to recreate old Victorian cakes – you know, the large, splendid cakes that were worked of art. Now, you should have a basic cake body. Choose white to make it easy to make. Now, apply lace to the bottom and third layer to allow for a decorated look. You can also add small, fake white beads to the top and second layer to allow for a beaded, elegant look. Tiny, fake flowers can also be placed on the cake (pink works well) to make it look authentic. Georgian Dollhouses are iconic, and they embody a period between 1714 and 1830. During this period, people started to pay closer attention to interior and fashion. People across the world visited Europe, and it wasn’t uncommon for people to spend a year traveling Europe. The upper classes enjoyed a posh lifestyle. And now over 185 years later, people try to recreate the Georgian dollhouse look. It’s a time that’s revered, and you can recreate these homes right at-home with dollhouses. 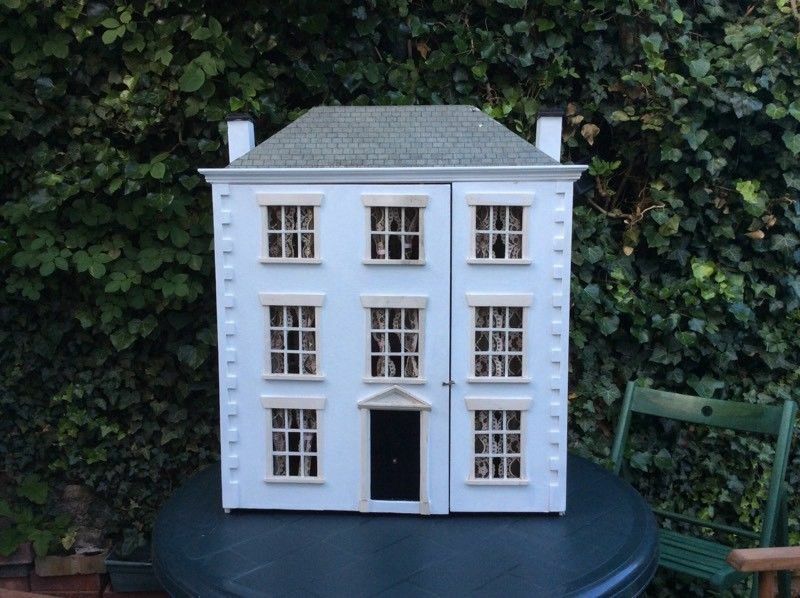 If you’re looking for a genuine way to create a Georgian dollhouse, we’re going to show you how to recreate your own. The latter is from the later period. You’ll also find that the floors were all wood (in most cases), and extensive usage of throw rugs was used. If the home was more prestigious, it wasn’t uncommon for marble or pale colored stone to be used on the floor. Wallpaper was used extensively. Squares and stripes were most common at the time. Cotton, floral fabrics were used on furniture pieces. Furniture was delicate during this period. Fireplaces were grand, and this meant that the fireplace was the focal point of the room. Eye-catching and elegant, these fireplaces were often adorned with ornaments and pictures above and around the fireplace. Fireplaces during the period were much larger than the traditional, small fireplaces we see today. The moldings in the rooms were elaborate, and classical figures and ribbons were used. Front doors contained a central knob, and there were no letterboxes present. The properties often included shutters. Whether you’re just getting started with the dollhouse hobby or you’ve been doing this for years, you’ve probably heard a lot of people talking about “miniatures.” What are dollhouse miniatures and why do you need them? Miniatures are exactly what they sound like – miniature versions of the furniture and accessories you would find in a typical home. Everything from beds to tables, dressers, vases of flowers and pictures on the wall can be found in miniature sizes for dollhouses. 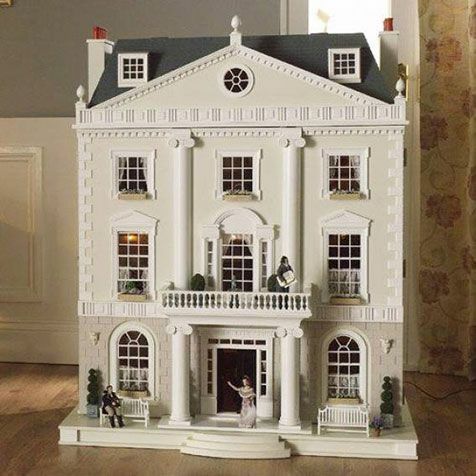 If you already have your dollhouse, you can start buying miniatures right away and placing them in your new little home. When shopping for miniatures, you’ll find a dizzying array of options. Many retailers sell sets, which can be convenient because you can buy an entire living room or outdoor patio set without having to hunt down matching pieces. Of course, you also have the option of finding and piecing together your own designs. Many collectors prefer to go this route because they can create truly unique looks. With that said, it can be difficult to find the exact pieces you want to bring your vision to life. Just like any other product, you’ll find budget and high-end miniatures. Furniture pieces and accessories can be quite expensive, particularly if you opt for handmade items. The trade-off is that handcrafted items are usually better quality and offer a unique look. Skilled artisans spend countless hours working on furniture and accessories, so they are truly worth every penny. There’s no right or wrong option here. Just choose miniatures that you can realistically afford. If you’re crafty, you can make your own furniture and accessories. While not quite as complex as creating large-scale items, making your own miniatures requires patience and time. Adventurous collectors who want to go this route will find helpful books at the local library and online. There are many hobbyists out there who truly enjoy making their own miniatures and are happy to share their knowledge. It’s easy to assume that making your own miniatures will save you money, but this isn’t always the case. It may cost the same, or more if you factor in the time it takes to make the furniture. But there’s a certain satisfaction in creating your own items. Whether you choose to make your own, buy a set, or hunt down all the pieces individually, miniatures will bring your dollhouse to life and add a little personality to your tiny home. Dollhouses often include wallpaper, and you can make your dollhouse truly unique with a little interior sprucing up. The wallpaper is easy to apply, or you can also paint the walls of the home if you don’t want to add wallpaper. But when you’re trying to recreate a period house, you’ll find that wallpaper was once hip and exciting. Georgian period homes had their walls covered in wallpaper, and when recreating one of these homes as a dollhouse, wallpaper is a must. If you’re assembling your dollhouse, wait right there. You want to apply the wallpaper before the walls are fully assembled. It’s very difficult to fit your large hands inside of a dollhouse to apply wallpaper to the walls. When the walls aren’t fully assembled, you’ll have more room to work. Specialty wallpaper or wallpaper designed for dollhouses can be used in the home. I suggest using wallpaper designed for dollhouses, and you’ll have an easy time finding most period wallpapers, too. Each room will require 3 sheets of wallpaper – one for each wall. Since the front of the room is open, you’ll need just three instead of four complete sheets. Once you’ve chosen your wallpaper, it’s time to apply it to your dollhouse and transform the interior. Special gel is available to put the wallpaper on the wall of a dollhouse. Glue tends to wrinkle the paper, and this is too much work for a dollhouse. Glue-backed wallpaper is available, too, but be careful when applying. You’ll find that the first wall is the hardest. Once you get accustomed to applying and cutting the paper, it will get much easier. Keep in mind that the reason to paint the wall before application is to keep the glue from seeping into the wood. Paint will act as a barrier, and while not a necessity, it can help protect the dollhouse further. I recommend applying the wallpaper from the top down and using a credit card from top to bottom to ensure the wallpaper is flush and bump-free.